Our daily walks are journeys of discovery. Last night Annie and I saw a calico-colored mouse, dead but totally intact, with its feet in the air. Tonight it’s gone. I thought I saw a really long garter snake under my bushes. Annie dove down to smell it and looked up, confused. It was a snake’s skin without the snake in it. Probably about two feet long. Now I want to know, where’s the snake that left its skin behind? There’s always something to see. We’ve seen eagles and deer, dead birds and sea lions. Early in the year, we found three-leaved trilliums signaling the beginning of spring. Orange-bellied newts slithered slowly across the street. As the trilliums turned from white to pink to purple, scotch broom painted the landscape yellow. Then came the rhododendrons in pink, red, white and yellow. Now it’s purple foxglove, white and yellow daisies, buttercups–and berries. While I was on vacation and Annie walked with the dog-sitter, my pup learned to pick berries. Now I can’t get her to stop. I’m too busy laughing anyway. She’s particular about her berries. Nix on the thimbleberries. Huckleberries are a last resort. She goes for the blackberries and salmonberries (which look like salmon-colored blackberries). I admit to snatching the occasional ripe blackberry off the vine, nibbling it delicately as red juice drips down my fingers. But Annie has no patience for delicacy. Nor does she seem to care whether the berries are green or past their prime. She will pass up every other plant and plunge her face deep into the bush, grabbing as many berries as she can, swallowing them whole, then looking up at me with a crazed grin. What a miracle; you can grab food right off the bushes. I think the miracle is that she hasn’t gotten sick or cut herself on the stickers. She’s one good berry-picker. Are you looking for a picture of the berries? She ate them all. I try not to advertise here, but I have a new book out. It’s called Childless by Marriage. Mostly memoir, it is about how women who wanted to be mothers never have children because their husbands or partners are unable or unwilling to bring a baby into their lives. The chapters talk about the decision not to have kids and the grief that follows, birth control, step-parenting, the “mom club,” old age without children, and, of course, being a dog mom. Find out more at http://www.suelick.com/Childless.html. I have several other books out, including Shoes Full of Sand, Stories Grandma Never Told, Azorean Dreams, and Freelancing for Newspapers. Click hereto read about them. All are available at Amazon.com in paperback, and all but Stories Grandma Never Told are also formatted for the Kindle e-reader. End of commercial. I like coming here to get away from the business of selling books. The blackberries and salmonberries are almost done. 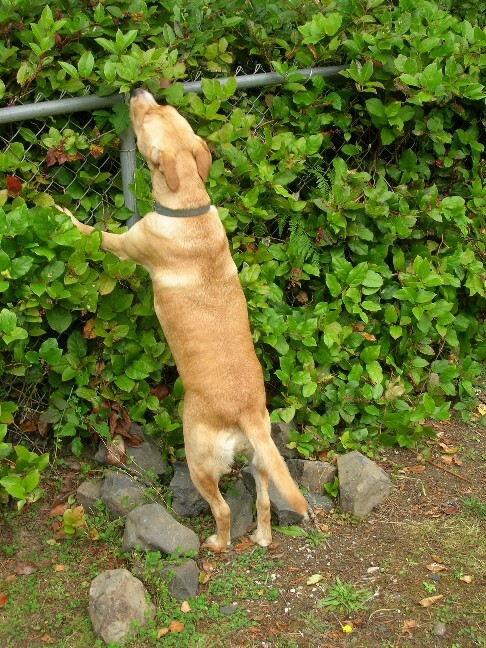 Poor Annie won’t know where to find snacks on our walks when the berries are gone, but I’m sure she’ll find something.